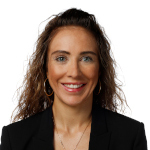 Ashley Ehlert is the Legal Director for International Ice Hockey Federation (“IIHF”), where she handles all legal aspects related to operating a global sports federation. During her tenure, she has helped form a European ice hockey league, drafted and negotiated global sponsorship and commercial rights agreements, reformulated the IIHF governance and disciplinary structure, implemented a global trademark protection and licensing program and helped the IIHF realize new media and big data opportunities in ice hockey. In addition to handling all IIHF legal aspects, she is secretary to the IIHF Legal Committee and the IIHF Disciplinary Board, is a member of the Champions Hockey League Disciplinary Board and is a member of the Legal Expert Group for the IOC Olympic Movement Unit on the Prevention of the Manipulation of Competitions. She regularly lectures at sports law programs including the FIFA Master in the Humanities, Management and Law of Sports and the ISDE Master in International Sports Law, speaks at various symposiums covering a wide range of topics, and lectures at integrity workshops geared towards players, coaches and administrators. Ashley holds a Sport Master’s degree from the International Centre for Studies, Juris Doctor and Master of Business Administration from Stetson University and a Bachelor of Science from the University of Central Florida. She is admitted to the Bar in the state of Florida, USA.